One of the reasons I don't even try writing fiction is that reality is often much stranger. A story involving three months of negotiations that went nowhere, a surprise election of the parliament speaker, a surprise reversal, overt foreign interference and a last-minute swearing-in of a new cabinet would have been dismissed as contrived and incredulous. And yet that's precisely what happened in Serbia over the past two weeks. After the constitutional referendum last fall, Serbia held parliamentary elections in January. The ramshackle coalition that had somehow managed to maintain a minority government since 2004 did not manage to win enough votes for a new mandate. But then, neither did anyone else. The Radical party once again got the biggest chunk of the votes, yet not enough for a majority. 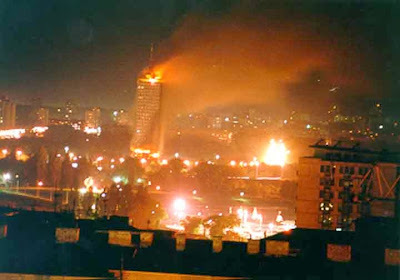 Imperial legates and EU komissars put considerable pressure on Serbia to establish a "democratic bloc" government - effectively resurrecting the old DOS coalition that executed a the October 2000 coup. For a moment there, early last week, their wish seemed doomed: prime minister Kostunica's DSS supported the election of Tomislav Nikolic, leader of the Radicals, as the parliament's Speaker. Amidst the resulting wailing, howling and gnashing of teeth, Kostunica reversed his position (or did he?) and successfully negotiated a deal with president Tadic's Democratic party and ex-partner G17 Plus. Nikolic resigned from his post after just four days, managing to retain an appearance of dignity and integrity amidst the parliamentary discussion that resembled a particularly vulgar episode of Jerry Springer. The new, "democratic" government has more cabinet posts than it used to under DOS, tailored to fit party leaders and trusted cronies. Now, if the powers of the Serbian government were properly limited, none of this would be an issue. Unfortunately, and even under the new Constitution, the state is still near-omnipotent at home (circumscribed only by the wishes of its imperial overlords). In two fields that one might argue are legitimate domains of the state - foreign affairs and defense - Tadic cronies and Imperial lackeys are now firmly in charge. I never thought I would regret the political demise of ex-Foreign Minister Vuk Draskovic, but his replacement beggars belief. To paraphrase ex-Reichsmarschall Rumsfeld, you make the government with the parties you have. It is just depressing that in today's Serbia, the only alternatives to this pathetic collection of lackeys, quislings and fools are the fist-pounding populist Radicals (who'd rather have Serbia be a Russian province, if at all possible), or the even greater quislings, lackeys and fools, ex(? )-Communist "liberal democrats." Serbia desperately needs a party - or better yet, a movement - that would seek to limit the power of the state in matters domestic, and ensure that in matters of actual national interest (defense of territory, lives and property of its citizens; foreign relations), elected representatives serve the people of Serbia, rather than the governments in Washington, Brussels, or even Moscow. Most people around the world would take these things for granted. In Serbia, they remain in the realm of fiction. At the Very least get Rid of Vuk Jeremic if he is as weak and incompetant as he seems.